​This year’s flu season is bad…and not just for humans. Did you know that dogs can get it, too? While Pennsylvania hasn’t seen a spike in cases, at least 13 other states have reported outbreaks of canine influenza (CIV) this season. 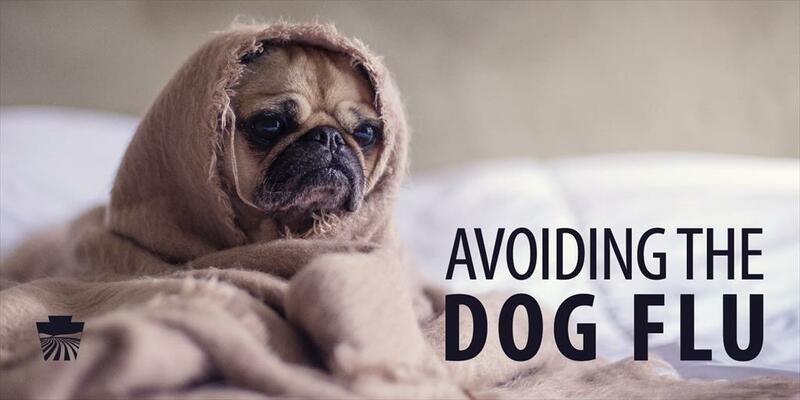 Just like in people, the dog flu is extremely contagious and should be treated immediately. CIV is easily spread through direct contact, nasal secretions (barking, coughing, sneezing), contaminated objects (kennels, food and water bowls, collars, leashes) and by people moving between infected and uninfected dogs. A dog that encounters the virus has an 80% chance of contracting CIV; once the virus is contracted, they may not develop signs of feeling ill for two to four days. All dogs, regardless of breed or size, can be infected. CIV cannot be transferred to humans. Most dogs will recover within two to three weeks, however there is a 10% fatality rate in dogs diagnosed with canine influenza. Young and elderly dogs are at a high risk for complications. While there are two approved vaccines against canine influenza, it is not usually recommended. It is considered a “lifestyle vaccine” and typically only recommended if your dog is regularly exposed to other dogs in situations like kennels, dog parks, racing, or dog shows. If your dog is coughing or you believe they have the flu, contact your veterinarian immediately. For more information about canine influenza, visit the American Veterinary Medical Association’s Pet Owner’s Guide for Canine Influenza​.